Wow, I didn't know Swiss men are so arrogant. It's not like they can master more than a dozen languages (no offense). Yeah, but can the Swiss play baseball, American football, and basketball? Many kids in America can do that with ease. It's all how you grow up. 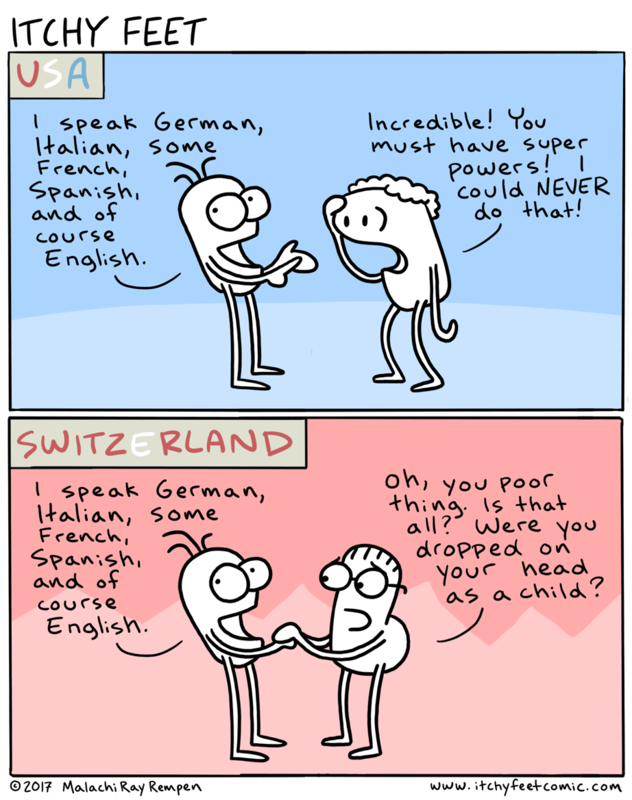 It's a lot harder for an American, growing up monolingual, to learn a bunch of languages, and therefore WAY more impressive than the Swiss who start learning at a young age. Just like it would be very impressive for a Swiss kid to reach a high level of proficiency in baseball, lacrosse and American football. Where would they practice? Who would coach them? I don't think learning a sport is as valuable or difficult as learning a language. Ich spreche Deutsch, English, und schlechte Spanisch, ich kann ein bisschen Italien und Chinesich, und ein wirklich kleines bisschen Japanisch und Koreanisch. Ich glaube das ist technisch sieben? "Ich glaube das ist technisch sieben?" Technically this isn't correct German.